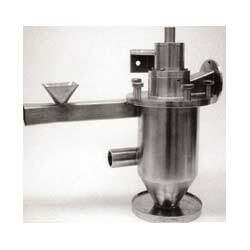 The Mini-split Air Classifiers were primarily developed for research “semi-tech” and small-scale production applications. An ideal choice for small work spaces, its low-noise capabilities reduce distractions while its compact size ensures efficient portability. This unique design is flexible enough for lab applications and rugged enough to meet small production requirements. All contact parts of the Mini-split Air Classifier are made from stainless steel, which helps to reduce maintenance costs and downtime while increasing operational life. The unit can be easily converted into an opposed jet fluid energy micronising system with an integral classifier. Operating under suction, Prater units always work to promote a dust-free environment. The capacities of feed and finished product bins can be adjusted to meet individual customer requirements for a truly customized machine that works with your specific needs.